(March, 2014) Siwoff Low Vision Center, PC, is proud to announce a new breakthrough in the treatment of macular degeneration and other retinal diseases. It is called the Pattern Electroretinogram (PERG). PERG uses lightweight electrodes placed on the eyelids and face of the patient. Retinal responsiveness is analyzed by a computer, which produces a graphical display of the electrical signals from the ganglion cell level of the retina. Several years ago, Dr. Ronald Siwoff developed a technique called Retinal Image Translocation (RIT). This diagnostic and treatment protocol makes use of high resolution digital photography to find the “window”, the healthy part of the retina. Now, this new tool (PERG) and treatment application samples many points in the sight window found on the digital fundus photos to find the point with the strongest signal. This new technique adds much greater specificity to the design of custom prismatic glasses. The average improvement in vision is about 200 percent. 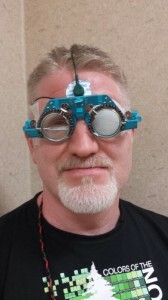 Although PERG technology is recent and available to other eye care providers, centers and hospitals, the computer analysis and treatment application was invented and developed by Dr. Siwoff. Because PERG is so new, Siwoff Low Vision Center, P.C., is the only center in the world to offer this advanced treatment. Research is now underway to publish the protocol and results of treatment for many patients with macular disease, diabetic retinopathy, retinitis pigmentosa and other diseases of the retina.